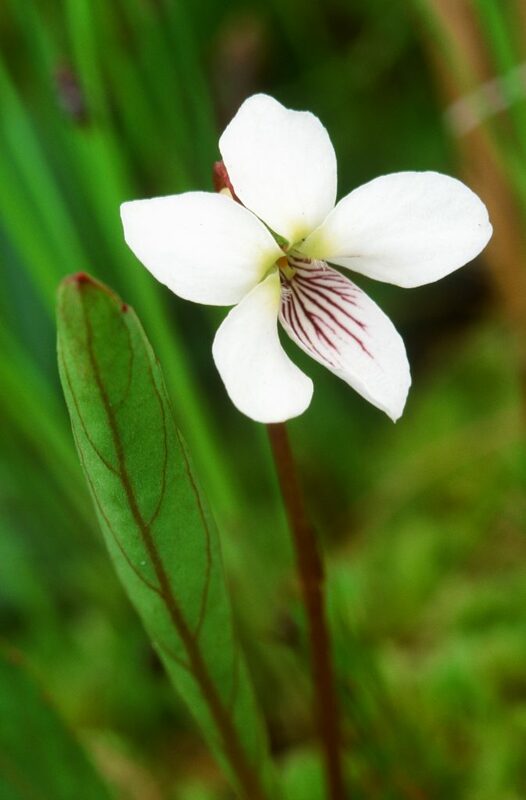 An erect glabrous violet with long, narrow lanceolate leaves and white flowers all arising from a slender vertical rhizome. Red petioles, red leaf midrib and veins, red leaf margin glands, red peduncles and red tips of the sepals make this species easy to identify. 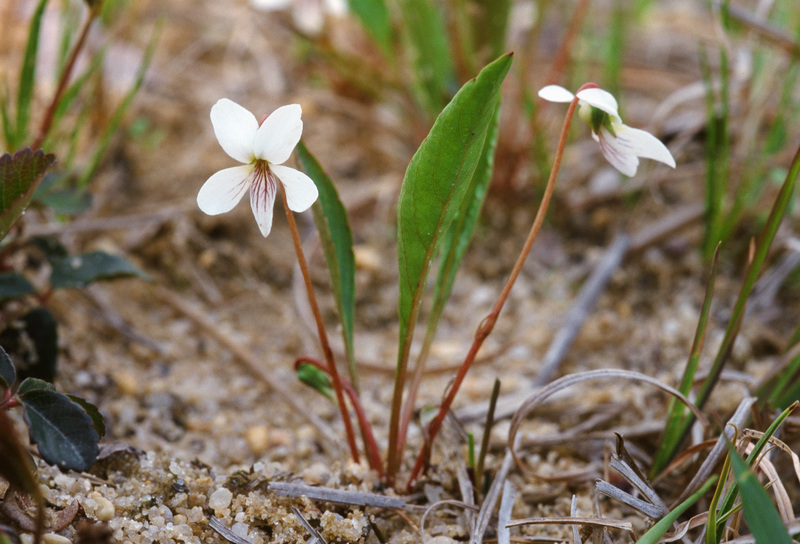 It grows in open sunny places, in moist to wet sandy soil. In New Jersey, it is found along the sand dykes that border irrigation channels for the cranberry fields, where the water table is high and the ground constantly moist. After flowering, red stolons emerge from the rhizome, spreading and branching to produce new satellite plants the following year. 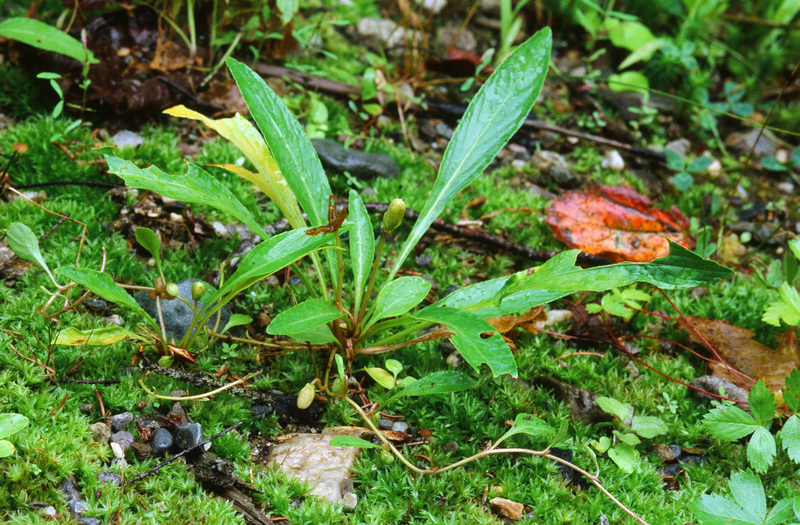 Single leaves arise from the nodes of the rooting stolon. Summer plants carry both pods from flower pollination (chasmogamous pods) on tall vertical peduncles and closed (cleistogamous) pods on short peduncles, both types arising from the head of the rhizome, while additional closed pods are produced from the axils of the stolon leaves. Found throughout eastern North America, it extends as far north as northern Ontario, and Nova Scotia. Its distribution ranges from coastal and piedmont regions to inland moist or wet lowland zones, as far west as Texas. Occurrences in Washington, southwest British Columbia, Canada and in Finland were introduced from the east coast along with shipments of blueberries plants for cultivation. Leaf blades at flowering are 2.5–12 cm long, and up to 2.5 cm wide lanceolate, the apex with a hard tip. Leaf margins are shallowly crenate, the base of the leaf tapers gradually to the narrowly winged petiole. 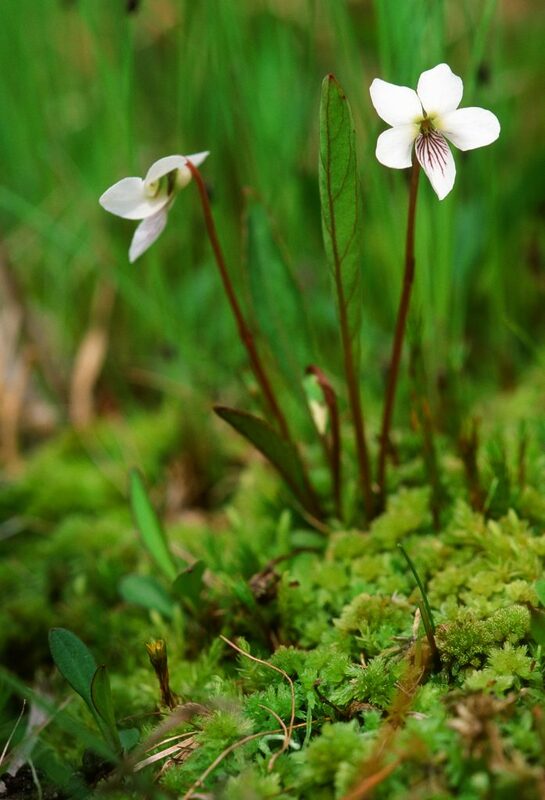 As with many other violets, the leaves grow to be much taller in summer, to 25-30 cm including the petiole, and 3.8-4.0 cm wide, two to three times their size at flowering. 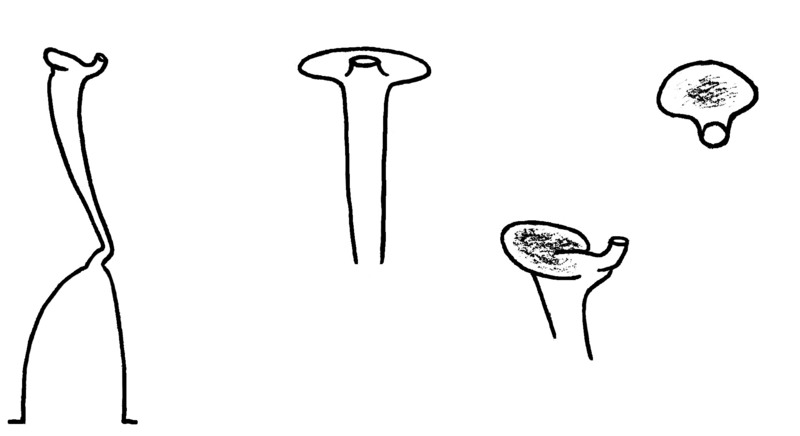 Stipules to 1.5 cm long, partially adnate to the petiole. Peduncles usually longer than the leaves, 10-13 cm, bracteoles are 0.3 mm long and spotted red. Flowers are carried above leaves, petals white, pale green in central throat, top petals reflexed, petals usually beardless, the lower petal and laterals veined with red-purple guidelines, petal spur rounded, 1.5 mm long, ovary and head of the style bright green; light sweet perfume. Flowers bloom in May to June. Sepals and appendages 0.5 cm long; sepals ovate to lanceolate with sharply pointed red tips and a red midrib. Pods green, long-oblong, 0.6-1.5 cm long; seed colour dark olive-brown to black, 1.0-1.6 x 0.9 mm. 2N=4X=24. The previously recognized V. lanceolata subsp. 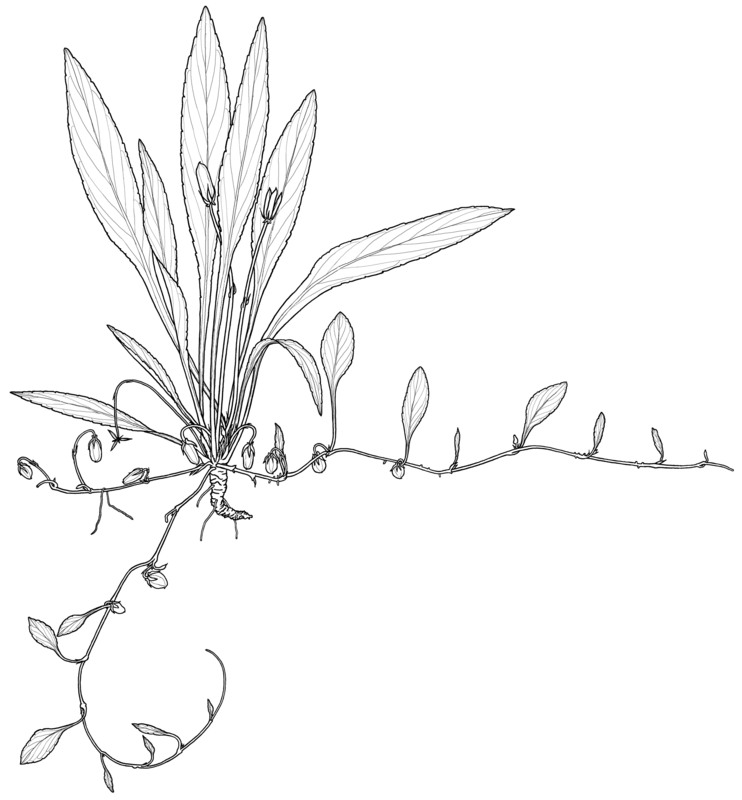 vittata, now included within the species V. lanceolata, was differentiated from the latter by narrower ribbon-like leaves and its southern distribution through the Atlantic and Gulf coastal plains of Alabama, Florida, Georgia, Louisiana, Mississippi and Texas. It thrives in the same damp to wet habitat. 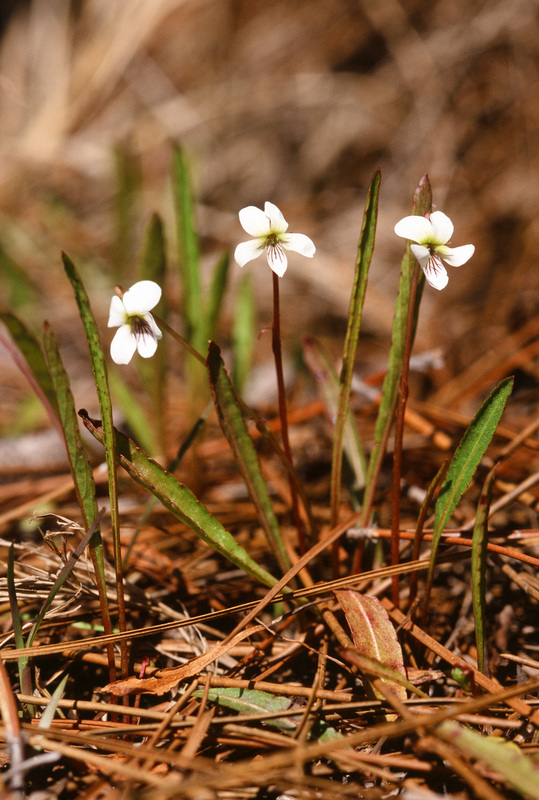 The smaller white flowers have a notch in the tip of the lowest petal. Flowers Feb-May. (Synonyms: V. lanceolata subsp. vittata (Greene) N.H. Russell, Amer. Midl. Naturalist 54: 484. 1955; Viola lanceolata L. var. vittata (Greene) Weatherby & Grisc., Rhodora 36: 48. 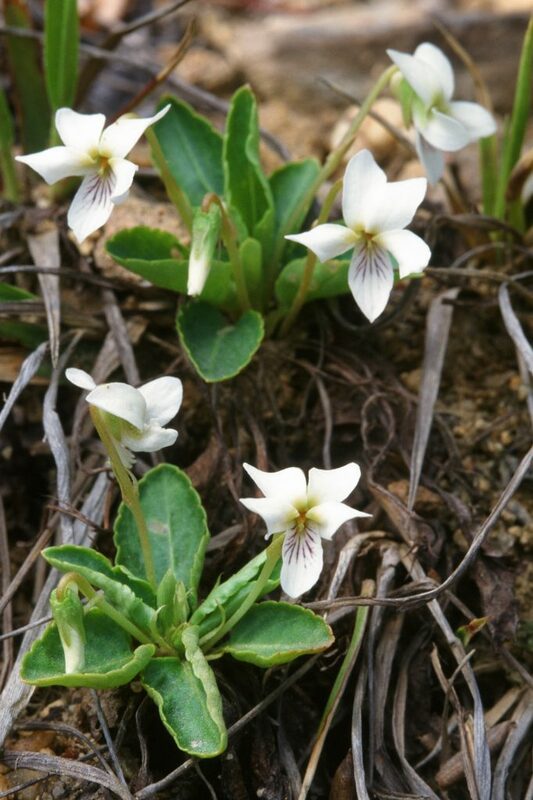 1934; Viola vittata Greene, Pittonia 3: 258. 1898. 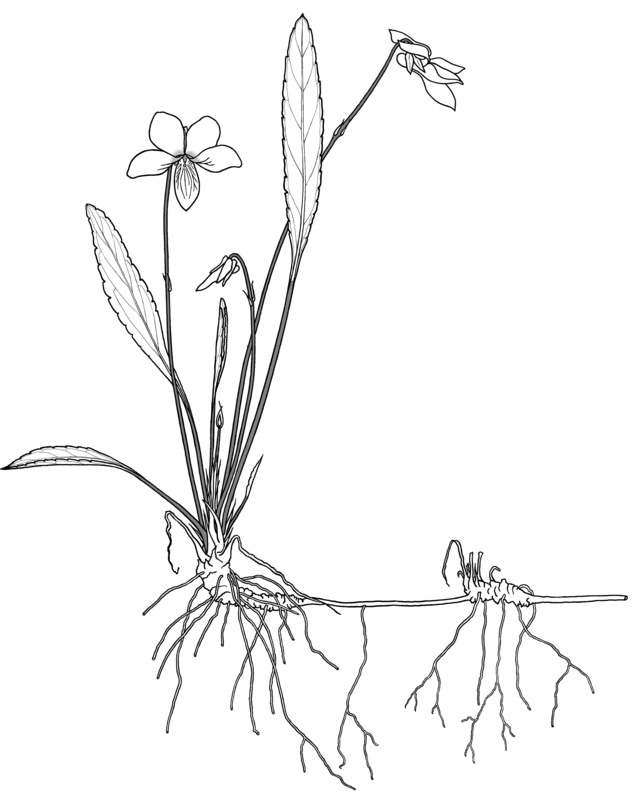 It will hybridize with Viola pallens, V. primulifolia and V. pedatifida var. brittoniana.